Ben thinks the universe needs to mind its business. If the universe had his back, he wouldn’t be on his way to the post office carrying a box of his former boyfriend’s things. But when Arthur and Ben meet at the post office, what exactly does the universe have in store for them? But what if they can’t quite nail a first date? Or a second first date or a third? What if Arthur tries too hard to make it work and Ben doesn’t try hard enough? What if life really isn’t like a Broadway play? But what if it is? Although I've never read anything by Becky Albertalli, I'm a great admirer of Adam Silvera. He creates diverse, profound characters that are beautifully complex. Unfortunately, this isn't the case with What If It's Us. As individuals, Arthur is a gentle and sensitive young man, his inexperience is incredibly endearing. Ben is a pensive character, enduring the melancholy of his relationship dissolving, proceeding the loss of mutual friendships. Through serendipity, the two young men meet, are separated, then attempt to reconnect by searching New York for one another. The character representation was a wonderful aspect. Ben is Puerto Rican and identifies as gay. He often feels ostracised due to his light skin, low socioeconomic status and unable to speak Spanish fluently. Arthur is Jewish, gay and originally from Georgia, yet residing in New York over the summer with his parents. Arthur manages his attention deficit hyperactivity disorder through medication, as does secondary character and Ben's best friend Dylan, to manage his heart condition. The secondary characters are a fundamental element of the storyline, in particular Dylan. Ben and Dylan share a wonderful relationship, unabashed and companionable. Dylan has a wonderfully flirtatious personality which creates lighthearted moments within the narrative. Ben often referenced Dylan as abandoning their friendship to accommodate a series of unsuccessful relationships. Dylan compassionate and consistently reassured Ben of his companionship. Jessie and Ethan are expendable unfortunately, although allegedly Ethan is a person of contention. Arthur believes Ethan is uncomfortable with his sexuality, creating an excessive intensity within the narrative. The whirlwind romance was rather an infatuation with one another. Although the scenes of intimacy were beautifully portrayed, Ben reassuring Arthur and placing the emphasis on consent, their relationship was overdramatised and inauthentic regardless of character sexuality. In the beginning of the narration, Arthur begins to pursue Ben obsessively. He learns of Ben's former boyfriend and through encroaching on his social media accounts, discovers an image of Ben and proceeds to create posters to ambush him. I found Arthur's behaviour incredibly intrusive. Ben, a young gay man of colour in a large city could have been endangered by Arthur's actions. Rather than being addressed, his actions were romanticised. One incident may be distressing to readers. Ben and Arthur are sitting with one another on public transport when approached by a man and his young child. The man proceeds to use threatening, homophobic and distressing language. Throughout the exchange, Arthur is incredibly distraught, Ben challenges the homophobic patron and another passenger intervenes. 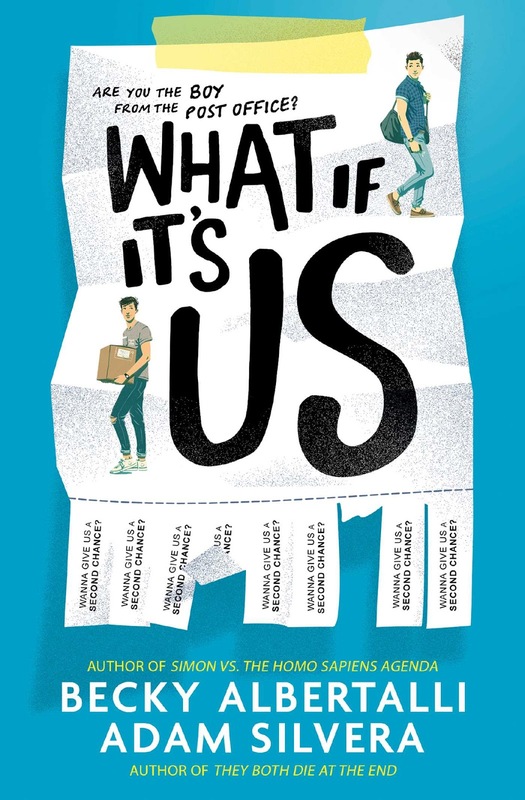 What If It's Us shares a similar narrative of a character origin story and although the lighthearted and tender moments were wonderfully written, it lacked substance. Two young men, a chance meeting and falling in love under the bright lights of New York City should have been the romance we've all been waiting for. I'm still waiting unfortunately. "Ben, a young gay man of colour in a large city could have been endangered by Arthur's actions. Rather than being addressed, his actions were romanticised." Wow... That is noooot good. I don't like the sound of that at all. I could understand the romance and being swept up in the moment but it just seemed as though it could have been addressed as it being potentially dangerous to place a young gay man of colour in that position. Especially as it was encouraged by adults. Although I still enjoyed it for the most part, it did sour my reading experience. I don't need substance (bahahaha) but I'm still really unsure of this one. I haven't read anything by Silvera yet but have had mixed responses to Albertalli's so far. Adam Silvera is a phenomenal author, having read his previous novels he generally creates wonderful, layered characters. The character development felt superficial, especially Arthur. Apart from his love of Broadway and finding love, I never really gained a sense of who he was as an individual. Streamlined into a novella and it could be mistaken for a character origin story. There is for sure a place for a light romance, but this reads like a story that needed depth -- it's a pity it didn't get there -- I like the premise! The premise sounded so lovely, I enjoy stories of serendipity and characters falling in love. I did enjoy aspects but overall it needed substance, especially through character development. I wonder if there might be a sequel as the epilogue was incredibly unsatisfying. I've only read Simon by Becky, which I loved, but I really love Adam's work, and it sounds like this is a lot fluffier than his usual fare. I don't mind fluff, but it doesn't seem it works all that well in this one. I'm starting this one next, so we'll see, but I keep hearing pretty mixed reviews (like this one) which is a bummer! Personally, it really didn't unfortunately. Despite how prolific each author is as individuals, I don't think their styles of writing were all that complimentary of one another. Really looking forward to seeing what you think of it Lauren. I think I might like this cover better than the US cover to be honest... Sorry to hear this one didn't turn out to be better than you wished! It sounds like there are others who feel the same way as well as I've been hearing mixed reviews about What If It's Us. I'm not exactly a fan of the Edward Cullen vibe though... no matter how pretty the portrayal is. If you look closely at both covers, the characters could be brothers apart from one having slightly lighter skin. It seems either readers have loved it or felt the same way I have. It felt more like a character origin story rather than a standalone novel unfortunately. It's still decent read Ailyn, quite enjoyable if you can look past the issues. As you know, I felt about the same as you did, Kell. This one just really missed the mark on many occasions, and though there were some cute moments and some nice relationships, overall it just didn't work out. And like you said, it could have been very dangerous for Ben, but that was never touched upon. I thought Arthur was OTT about finding Ben, and if I were Ben I don't know if I would have wanted to reach out to him after all that, anyway. I'm so sorry we didn't love this one, Kell :( Hopefully that perfect romance will head our way soon. He really was quite dramatic when it came to Ben in general wasn't he. When he missed out on the tickets to see Hamilton and Arthur became quite aggressive, it was incredibly uncomfortable and showed Arthur had a sense of entitlement which considering Ben's socioeconomic status, was quite insensitive. I think I just expected a feel great read rather than feeling indifferent. I'm sorry this one didn't meet your expectations! I've seen a lot of meh reviews for it, so my expectations have dropped pretty significantly. I remember seeing a lot of hype and excitement over this book, and it's disappointing that it's lacking substance. I've enjoyed books by both of these authors, and was hoping their duo would be bananas good. I thought the same unfortunately. It's still enjoyable and entertaining but I think when you have two incredibly popular authors you expect greatness and so many readers will really enjoy this one. Just wasn't for me sadly. I'd love to see what you think of it though. I’ve loved what I’ve read by Becky Albertalli, but I’ve never read anything by Adam Silvera. Sounds like the characters are truly beautiful, but the romance, not so much. Shame, seems like there was potential for greatness. So, so much potential. I have absolutely no doubt that many readers will disagree with me and although I did enjoy it in parts, overall I expected something spectacular. Gosh, that tantrum was unfortunately the last straw for me. It felt so entitled and unnecessary considering Ben's socioeconomic status. Wow, so I thought this would be a different read than what your review makes it sound like and I'm thinking maybe I won't enjoy like I hoped i would. I've liked some of Becky Albertalli's stuff so I'll try and borrow from the library and see how it goes.